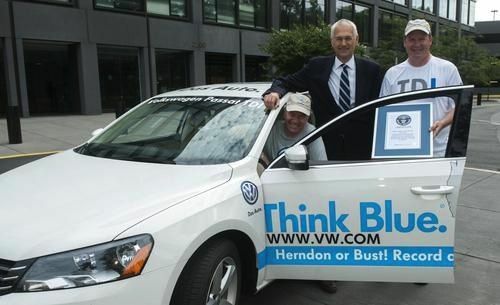 2013 Volkswagen Passat TDI gets astonishing 77.99 mpg and sets a new Guinness World Record for fuel consumption. Want to know how to get 78 mpg in a Volkswagen Passat TDI? Volkswagen has just announced there has been a new world record 77.99 mpg that was achieved in one of their new diesel Passat’s. In fact it set a new Guinness World Record for the lowest fuel consumption in the 48 U.S. states for a non-hybrid car. And it’s 10 mpg better than the previous mark of 67.9 mpg that was set by a hybrid vehicle. So how did they do it and can you get that kind of mileage too? The impressive record was set by Wayne Gerdes and Bob Winger driving a factory 2013 Volkswagen Passat TDI Clean Diesel with a manual transmission that has an EPA estimated 31/43 city/highway fuel mileage. But Gerdes is a professional fuel mileage expert and is the founder of cleanmpg.com and makes a living “hypermiling” and has set mileage records in more than 100 vehicles. He also set the record for the lowest fuel consumption in a hybrid vehicle. While the feat is impressive and was set in a “real world” driving environment, there is a catch of course. Gerdes employs some very special driving techniques in order to pull off this kind of mileage. He does give some great fuel-saving pointers, but no driver will get this kind of mileage in the real world. Gerdes and Winger drove the 2013 Passat Clean Diesel in ways most drivers will never drive. What did Gerdes do to get this incredible mileage? How was 77.99 mpg achieved? They also used downhill momentum to help crest an uphill section of highway. They pulled away very slowly from a stop light and coasted between traffic lights, and they never went over the speed limit. They also went 55 instead of the posted 75 mph limit on the Interstate. In other words, they were driving very slowly and conservatively during the over 8000 mile trip. But is this possible for you? Can the average driver achieve this kind of mileage? While it sounds good and drivers can use these techniques to achieve better fuel mileage, it wouldn’t be prudent in many real world circumstances. Have you ever been traveling at highway speeds and come up on a vehicle that is traveling 20 mph slower? It can lead to a traffic disaster and is actually what causes many serious accidents. If all the vehicles are traveling at the same speed, it’s much safer. And how annoying is it to have someone coasting between stop lights when you are in a hurry to get to work? There is a big difference between great mileage and setting world records. Volkswagen owners can expect to get around the estimated 43 mpg highway mileage or a little better if they always drive under the speed limit and are the slowest car between stop lights. Setting the professional drivers record aside, the 2013 Volkswagen Passat TDI Clean Diesel gets very good fuel mileage and shows just how economical the vehicle can be.